As specialists in alternative lending, the team at Matrix Mortgage Global are experts in second mortgages and home equity lines of credit (HELOC). Put simply, a second mortgage is a loan which uses your home’s equity as leverage. The loan comes to you in a lump sum of cash which can then be used as you please. It is common for second mortgages to be used for consolidating high interest debt or paying for emergency expenses such as medical bills or repairs. If you have built up equity in your home, yet are still having trouble getting approved for other kinds of loans, a second mortgage could be a good option for you. At Matrix Mortgage Global, we can show you how you can access as much as 85% of your home’s equity through this mortgage solution. Contact us today to learn whether a second mortgage or one of our many other mortgage solutions is the best choice for you. Regardless of your credit history, you will still be able to qualify for a second mortgage provided that you have equity in your home. Even if you have been through bankruptcy or consumer proposal, you won’t be turned down. 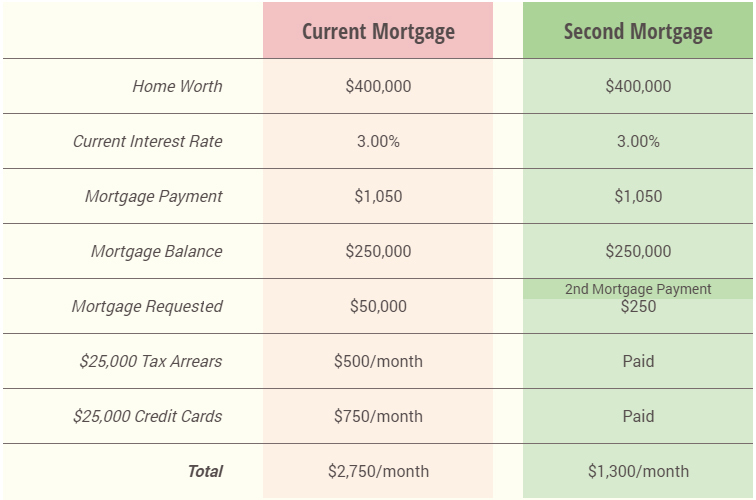 A second mortgage can even help you improve your credit because it will enable you to pay off high interest credit cards and other debts including income tax arrears, liens and judgement. Imagine having more cash in your pocket to save for your financial future. If you would like to know whether a second mortgage is the right product for you, then you owe it to yourself to contact Matrix Mortgage Global. Our experts will get to know you and your financial situation, help you compare options and offer recommendations most suited to your needs. Whether they recommend a second mortgage or another mortgage solution, they will always take the time to explain the details so that you can feel confident about your choice. Furthermore, because our team has access to such a large pool of lenders, we will compare rates and terms to help ensure that you get the right product at the most competitive price. We will even help you will all the paperwork to ensure that there are no delays in getting your loan. If you are interested in a second mortgage or any of our other mortgage solutions, contact us today for your free consultation.